SamuiBus.com | Book Airport transfer to Laem Set in just a few minutes! 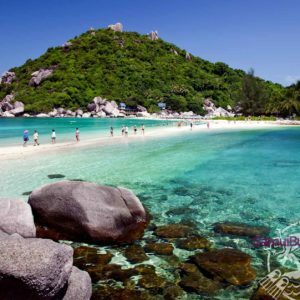 Laem Set Beach is one of the most beautiful and at the same time is one of the unsuitable for water treatments beaches of Koh Samui. Unhurried walks, meditation and photography shoots – that’s what it is really good for. From Laem-Set Beach you can see the nearby islands, and behind them – the shape of the mainland coast of the Suratthani province. On the blue surface every now and then float the boats of fishermen and the marine mollusks collectors. Get from the Koh Samui Airport to the hotel in Laem Set Beach and back will be so easy if you will think about it in advance. Just book Transfer service!